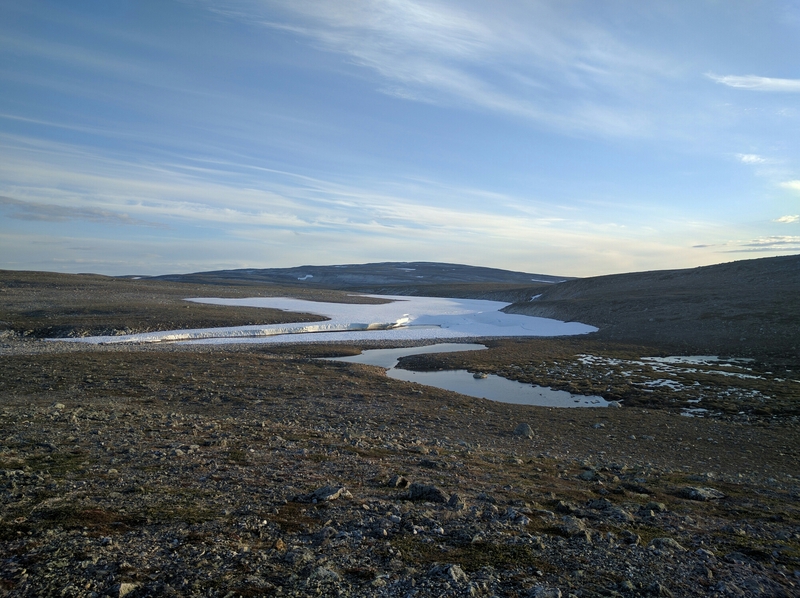 I never figured out the land on the high plateau between Kunes and Lakselv. Ridges and rock shifted around in my head. Crevices hid behind smooth hillsides. Lakes and rivers drained in odd directions.Nothing felt steady, nothing went where I thought it would. It felt like a blended pile of rock, water, and tundra dumped in heap and left unsorted. So I stopped trying to figure it out and embraced the oddness of it all. I found a distant mountain to set my compass, and gave in to the confused terrain of gentle slopes, fingers of jumbled rock, and water running in all directions. Embracing the strange, losing myself in the jumble, poping up on a ridge, watching my mountain grow, losing myself again, that was beautiful too. It went like that until the midnight sun dropped as low as it dared then began its rise again. I stood on the once-distant mountain looking back at the confusion with a smile. Sometimes all you figure out is that some places do not want to be figured out, that you are just a visitor, that your eyes are too small to understand what it going on in all that jumble of rock, water, and tundra. Posted in Europe North to SouthTagged backpacking, ENS, Europe North to South, featured, hiking, kunes, Lakselv, NorwayBookmark the permalink. Incredibly beautiful – both picture and words!!! Following every step. THANKS for including us in your group post. 4th of July, bratwurst, baked beans, potato salad and dessertsâPLUS fireworks!! Wish you could make it sometime. Daniel, LIFE is just as you described the topography: a mixed bag of unsorted bits and pieces, often following no logic. We are ALL visitors here. I’m delighted you’re sending me beautiful gifts almost daily from an open heart that lives life up close, personal, and a little on the WILD side. We’re missing you in Tallahassee!